1st - Simon Vardigans - "I just kept going"
Richard donated his bottle of champagne to Pete Wyld who put in a great deal of time and effort to provide scores each day - thanks Pete. Many thanks also to Simon and Marnie for yet another magnificent barbeque to round off the day. Let's hope this isn't the end of summer..........although we do now have Aboyne to look forward to. 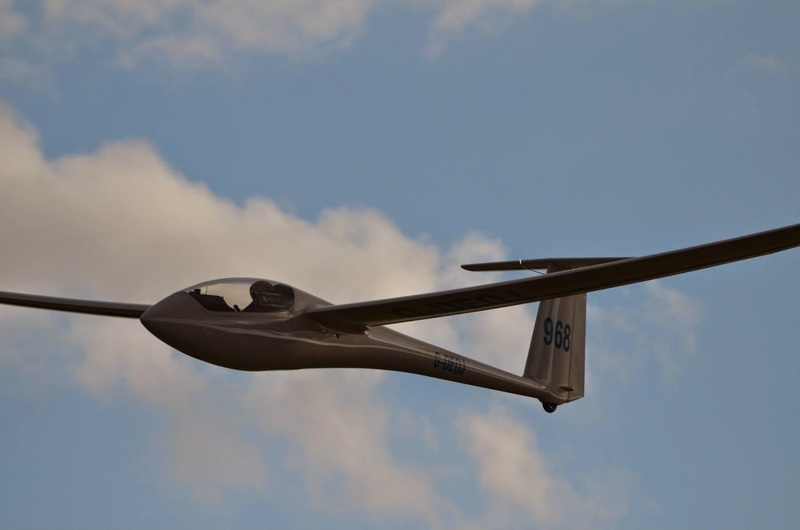 We have reported on five of our pilots who were competing in UK comps last week, but we overlooked one member who was flying the flag in an overseas one - Geoff Tabbner was competing in the 18m class of the Coppa Internazionale del Mediterraneo at Rieti. The weather was a bit warmer there than in the UK and they managed 6 comp days. Geoff came 5th on Day 2 and 9th overall. Well done Geoff. It looks as though a strategy of not launching is the best way of staying in the race. It hasn't been the best of days for a cycle ride, but George was back at 5.30pm as promised, having cycled a total of 137 miles. The last bit, up the hill out of High Wycombe, must have been a bit of a trial, but he looked surprisingly cheerful - though he may not be sitting down much for the next couple of days. George was supported in his ride by his family who met him at various points en route to feed and encourage him. He was greeted at the clubhouse by grandparents Bob and Vera, parents John and Yvonne, and twin brother Ben. George was making this fantastic effort to raise money for a glider for the cadets to fly. If you haven't already sponsored him, please make a contribution at the office. The weather Gods have been kind this morning ( so far ) as George set off on his epic 200km bike ride to raise money for the cadet glider. His route will take in Enstone, Hinton on the Hedges, Buckingham, Milton Keynes, Leighton Buzzard, Tring and then back to Booker through the Chilterns. At just over 130 miles this is a fantastic challenge and would be the furthest George has ever ridden. For those that haven't had chance to sponsor him yet there is an envelope in the office. 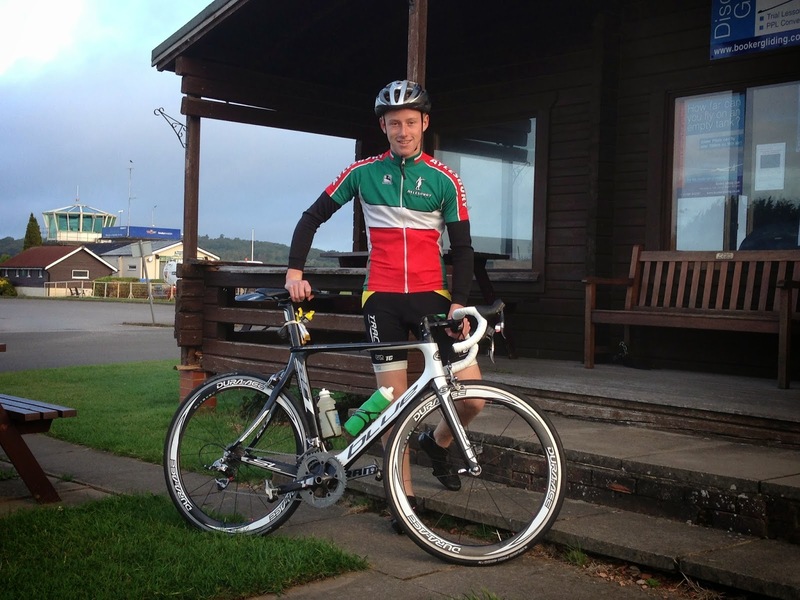 He hopes to finish at the clubhouse at around 5.30pm, please come and cheer him home if you can. Jim White came 8th in the 15m Nationals, having flown consistently all week, protected his position and, as he says in his blog ,'made his own decisions' as opposed to following someone else round. Mike Gatfield came 9th in the Junior Nationals, he was 3rd on Day 1 and 2nd on Day 6 but then broke that golden rule of comps about not landing out and dropped a few places overall. 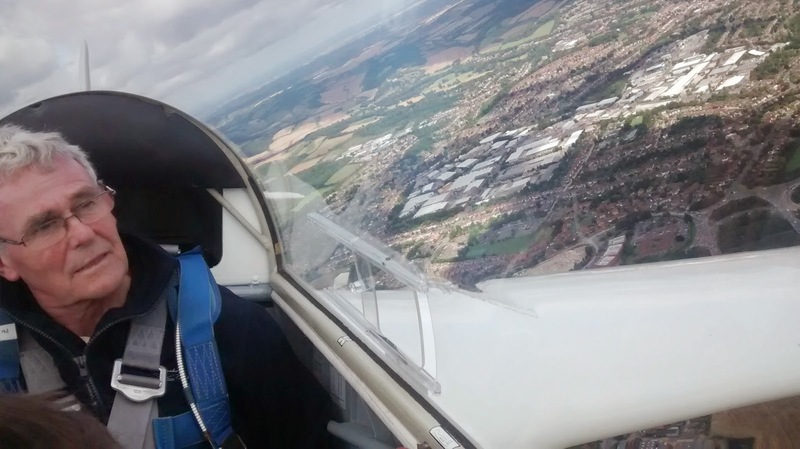 William Parker came 7th in the Blue class at Dunstable Regionals, with two Day wins and a 2nd place, but a rest day (after a late return from retrieving a fellow competitor) and an airspace penalty reduced his overall position. Jan McCoshim came 11th in the Red Class with some good consistent flying throughout the week, only landing out when everyone else did too. Nick Jennings came 20th in the Grandsen Regionals, a very good effort for his first ever comp and a tough week with some loooong tasks resulting in lots of landouts. He came 13th on Day 4 on a task of 300ish k and 8th on Day 8 after which he decided to rest on his laurels and skip Day 9. Meanwhile back at Booker the weather gods are not favouring our HDT comp, but UK weather is very unpredictable so we remain optimistic. Yesterday was scrubbed on the grid after the Juniors had launched. So I went to see my mum....ahh. Nice dinner with bro at The Royal Southern Yacht club, which is even smarter than Lasham! Today has started overcast but promises to improve at lunchtime. I suspect we shall have a longish task to the NW which could be fun. More later. 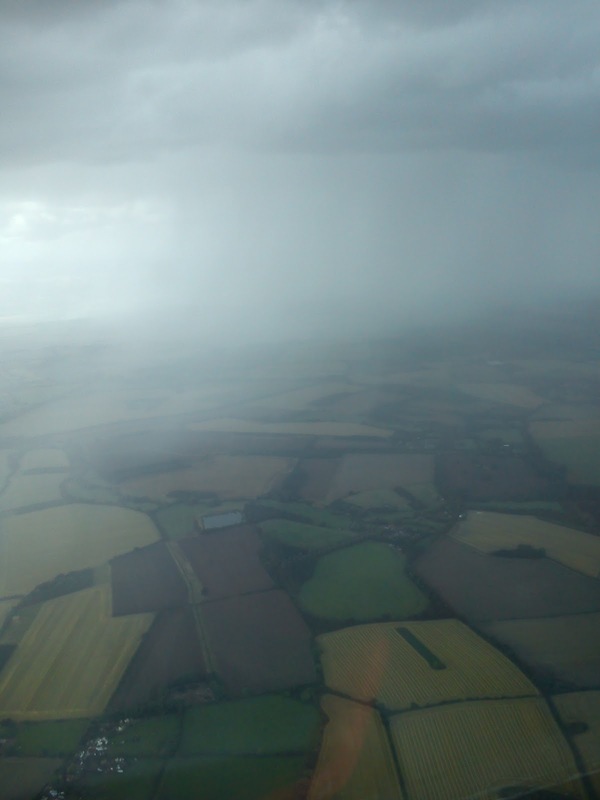 It's been quite a tough week for comp pilots, with some very mixed weather. Mike Gatfield is doing well at the Junior Nationals, where they have so far had 5 contest days, including one where they all landed out. Mike came 3rd on Day 1 and currently stands at 4th overall. Elsewhere, 9 seems to be the number. Jim White is currently 9th overall in the 15m Nationals (4 contest days so far), with a 6th place on Day 1. You can read more about his experiences at J1M at the 15m. At the Dunstable Regionals, William Parker is currently 9th overall in the Blue class. He came 4th on Day 1, and then had a rest on Day 3, having got back late from a retrieve the previous day and then spent what remained of the night freezing in his tent. He came 2nd on Day 4, a cold windy day where no-one got back. Jan McCoshim is also 9th overall in the Dunstable Red class (5 contest days), with a 5th place on Day 1 and 7th on Day 5. Meanwhile at Gransden Regionals, Nick Jennings is experiencing his first comp. They have had 6 contest days and some very long tasks, and Nick - along with lots of others - has been landing out all over East Anglia. On Day 1 only one person got back. Nick did very well on Day 4 to come 13th with a speed of 85.5kph on a task of 347k. It's been a tough couple of days for our pilots flying in comps around the country, but they are hanging on in there. 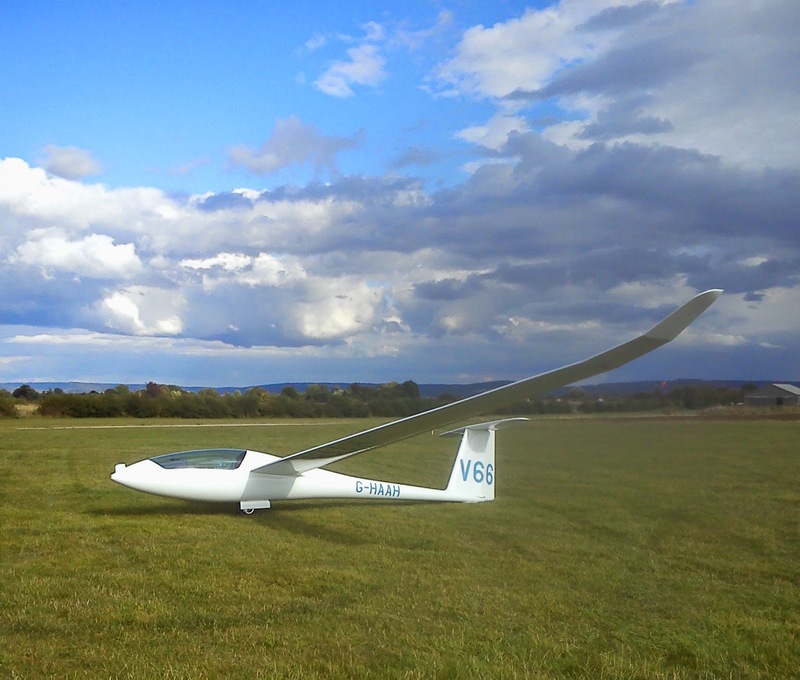 Sunday was a bit of a challenge, Dunstable scrubbed the Blue class but all the others flew and there were gliders in fields all across the south of England. Yesterday was also hard for task setters and pilots alike. At Lasham the Juniors set off first and were soon practising field landings again. The 15ms launched, relit, sat around and then scrubbed. At Gransden the weather was better and they were again set a long task - 312k - they breed 'em tough in East Anglia - from which one person got back. At Dunstable both classes were scrubbed. After all this hard work we have William in 4th place overall in the Blues at Dunstable, MiniGat in 5th in the Junior Nationals and Jim in 6th in the 15m Nationals. The weather looks a bit better today so they should all get away - and back. And here's a pic of MiniGat actually in the air and not a field, taken by Andy Cockerell. A tough day to fly cross country so congratulations to all those pilots mentioned below. Nearer to home, a great start to a day of instructing, I had the pleasure to fly with Booker Royalty; Gerry decided to blow off the cobwebs and have a go, releasing at 1,200 feet in tricky conditions he then showed some of the scratching single seaters how it should be done. 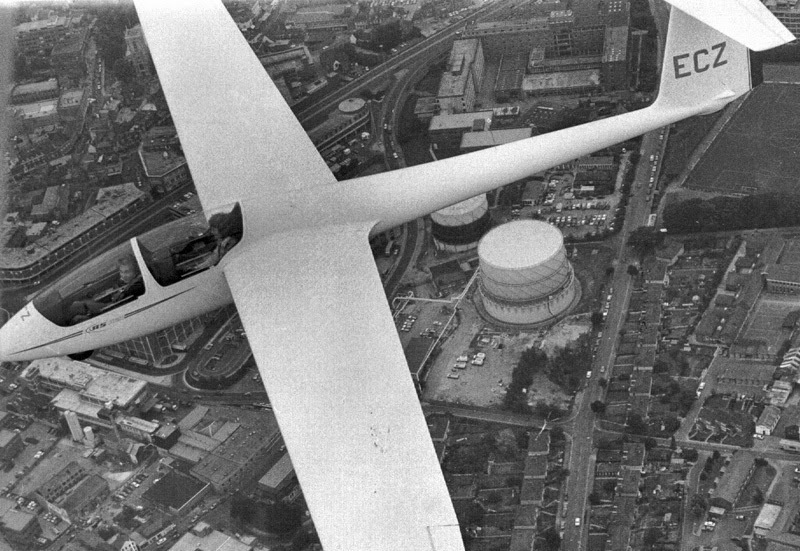 Sitting in the front as we climbed over High Wycombe, I knew what it must have felt like for Gladys, the local Mayor, when she flew with Gerry in ECZ back in 1982. Plenty of action on the comp front this week, with five of our pilots competing in various comps. Today looks as though it was a bit tricky. 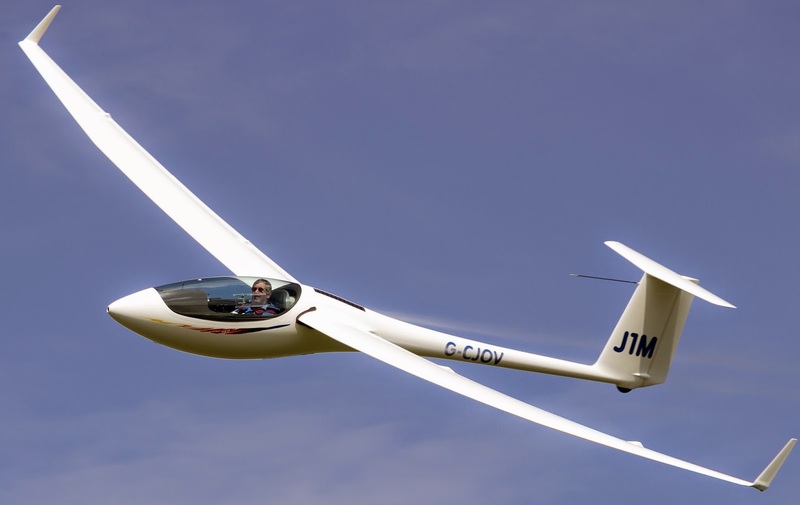 Mike Gatfield is flying in the Juniors at Lasham where they were set a task of 203k. Mike got back - unlike quite a lot - and came 3rd with a speed of 85.2kph. 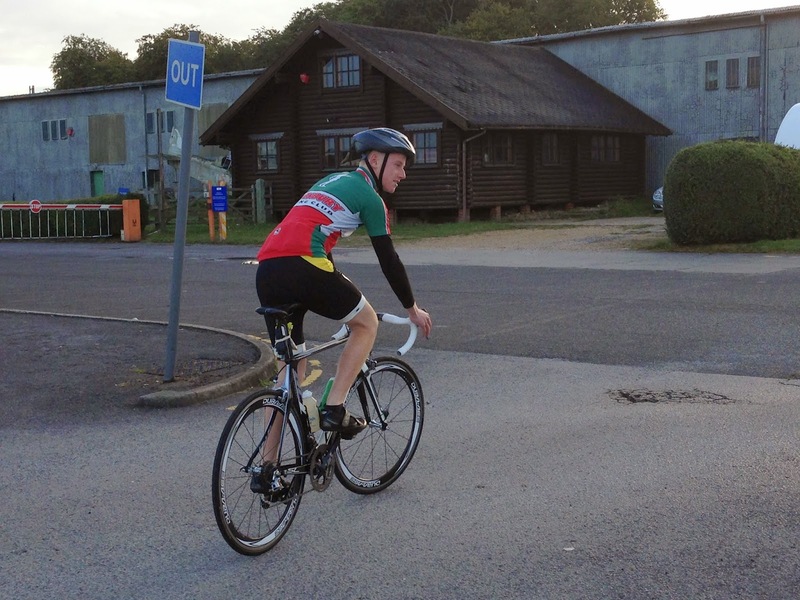 Jim White is in the 15m, also at Lasham, they were set 227k and Jim was 6th at 82.2kph - at least he got back, many didn't. Nick Jennings is flying his first comp at Gransden Regionals. They were set an alarming 317k and one person got back. Nick did at least set off, and became acquainted with a local field fairly early on. Jan McCoshim is flying in the Dunstable Regionals, in the red class. The task was 274k, one person got back and Jan scored a very creditable 5th place. 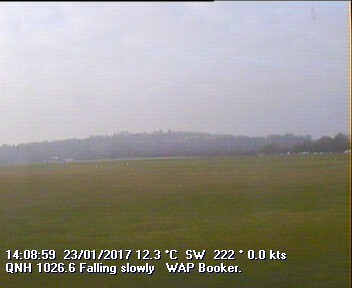 William Parker is also flying at Dunstable (blue class) where the task was 179k and it looks as though no-one got back. William came joint 3rd with a distance of 142k, though the results are still preliminary. As before I will be blogging from the 15s. If you are interested in following or just interested in what happens try jimboffin.blogspot.com for a laugh! Last time I flunked the first day!! This year there is a really hot field of pilots and with a bit of help from the weather Gods we look like we may have a really good competition.